The spirit of generosity was strong during Giving Day 2017. Photo by Dan White. They wrote out checks for thousands of dollars or handed over fistfuls of pocket change. They fished out 50 cents from their pockets, or laid out crisp $20 bills on the table. And the end result was this: by the end of Giving Day 2017, a 24-hour online giving fest at UC Santa Cruz, donors raised more than $520,000 for 118 worthy projects ranging from stamping out hunger to helping young women on their way to success in STEM careers. These donors did more than just improve on last year’s success. They surpassed last year’s total fundraising figure—$340,000—by early afternoon. And then the numbers just kept ticking up and up. 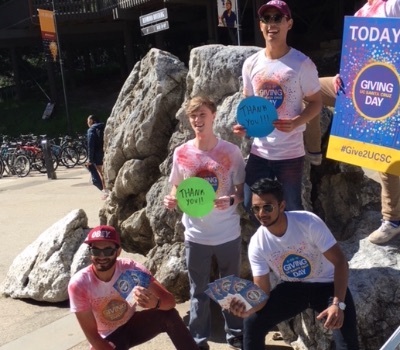 The grand total is more impressive considering that the 5,642 gifts included a large number of "microdonations"—modest-sized but impactful gifts that broaden UC Santa Cruz’s culture of philanthropy. While many donors gave to specific projects, others gave to a fund called “Area of Greatest Need,” giving the university the discretion to use the money where it is needed the most. This was the case with UC Santa Cruz staff member David Schulkin, who works in the Recreation Department. “There are so many good causes that I thought, “Aw, shoot, I can’t decide! '” he said, pausing at the Giving Day “pop-up” booth on the East Field. Many other donors had a similar notion; by the end of the day, “Area of Greatest Need” had raised close to $16,000, with 100 individual gifts. Every gift was tallied, and every gift counted. Sid Verma (College Ten ’18, computer science) said even small contributions would help make the Holi Festival, scheduled for April 14, a success. Holi, an ancient Hindu religious celebration, is known as the Festival of Colors or the Festival of Love. Walking through Quarry Plaza on Giving Day, potential donors could see a wide array of booths and tables. Two students, Katie Alibrio and Rachel Norton, were out taking cash donations for Students For Haiti Solidarity, a nonprofit organization raising money for college students in Haiti. Gifts to this organization have an oversized impact; the group aims to raise enough scholarship money to fully fund five Haitian students this year. Part of the fun and nail-biting suspense of Giving Day comes from the "real-time" aspect as well as the friendly competition between projects. For example, Formula Slug, a student-run, nonprofit sustainable engineering organization, won this year’s “Mad Dash” Challenge, which went from 6–8 p.m., adding $2,500 to their project. Formula Slug also won the Final Frenzy Challenge and bonus $10,000. Undocumented Student Services also put in an amazing showing on Giving Day. The organization, which provides much-needed services and support to ensure the graduation and retention of undocumented students at UC Santa Cruz, took second place in the number of donors for the Final Frenzy Challenge. The STEM Diversity office, which runs programs that help undergraduates from underrepresented groups in the sciences pursue STEM research, also led a project that raised funds for research opportunities for AB540 and DACA students. The combined funds raised by both projects was $31,000—an impressive figure even by the standards of the day. He said the sheer number of funded projects has helped UC Santa Cruz create “a new tradition of nontraditional thinking” around philanthropy. Not surprisingly, the event was the talk of the town, with patrons murmuring about competitive fundraisers at coffee shops all over Santa Cruz, and social media lighting up with “thank you’’ messages as well as exhortations to keep on giving. Cal Teach UC Santa Cruz , part of a systemwide program for undergraduate science, math, and engineering majors who want to be teachers, sent out a message of thanks on Twitter for $5,000 in gifts that will go toward its student internship program. Donors stepped up in a big way. By midnight, UC Santa Cruz Women’s NCAA Basketball raised about $14,000, Art in the Arboretum raised $21,000, the Scholarship For Military Veterans had received nearly $8,000 in matching gifts. People came out in force to support Girls In Engineering; matching gifts exceeded $6,000. And the gifts keep coming in, and are gratefully accepted. The message was loud and clear: Anyone can be part of a culture of generosity. A few hours after the give-fest began on Wednesday, Marissa Salazar (Merrill ’18, sociology) donated to a fund that supports women in the sciences at UC Santa Cruz. Her gift was in honor of International Women’s Day, which fell on the same day as Giving Day.